Whisk half a teaspoon of salt, asafoetida into the batter. 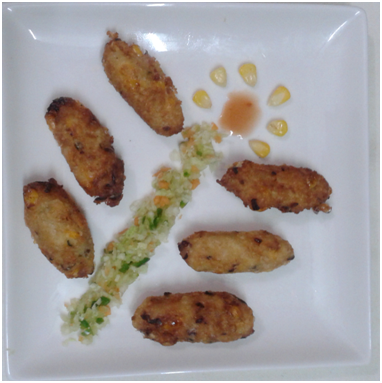 Drop batter in tablespoonfuls in it and fry until light golden. Drain onto an absorbent paper. 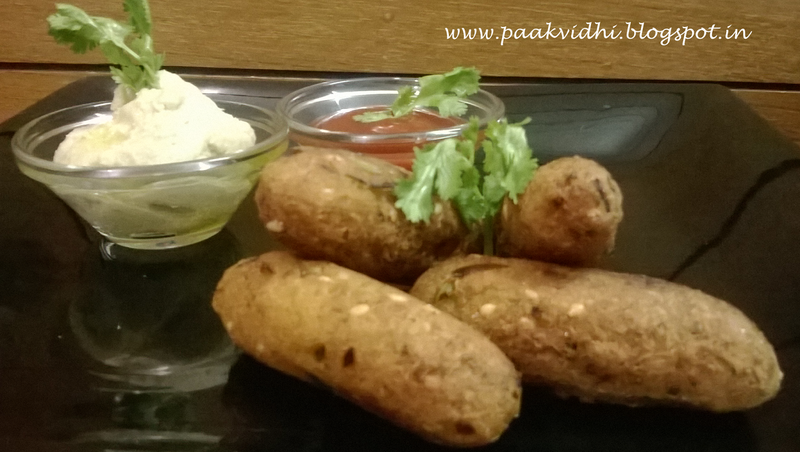 Put vadas in sufficient quantity of hot water. Leave for two minutes. Squeeze between your palms to drain out water. Mix sugar and salt with hung curd with the help of a blender. Add grated ginger,green chilies and the vadas to the curd. Heat oil in a pan and when it is hot put in cumin seeds and curry leaves and when it start to splatter take it off from the fire and put the tempering into the curd and mix well. 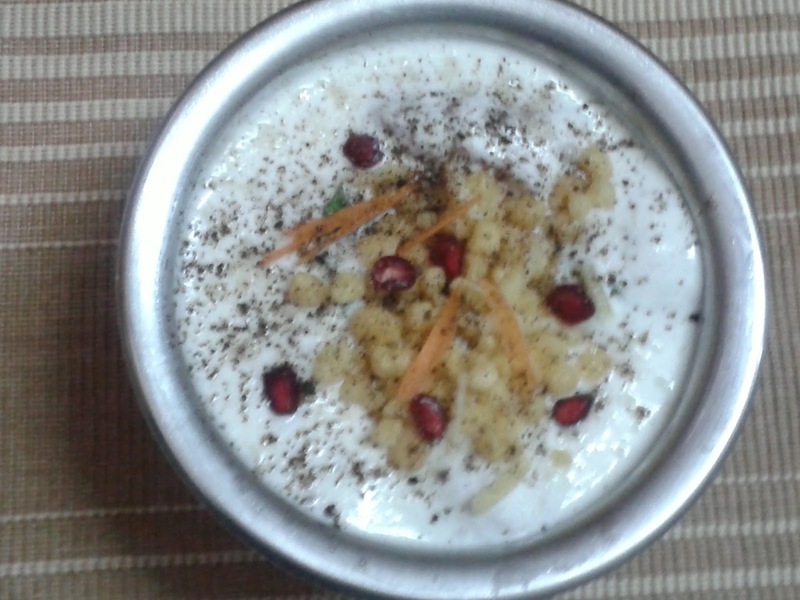 Garnish with boondi,ginger juliennes, pomegranate seeds,beetroot juliennes and chaat masala. Peel the cucumbers and check for bitterness. Cut the cucumber in 1"-1.5" long pieces. Scoop out , just a little, to get a small cavity in each piece of cucumber with the back of a teaspoon or a scoop. Mix hung yogurt,boiled black gram,salt and pepper powder in a bowl. Fill the cavity of cucumber with this filling. 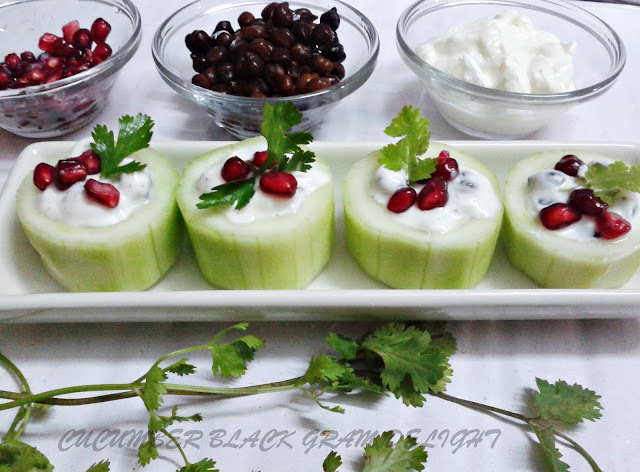 Garnish with coriander or mint leave and pomegranate seeds. Keep them in the refrigerator and serve chilled. Incorporate two tbsp oil into the dough and cover the dough with a wet cloth. Keep it aside for an hour. Now grease the balls with a little oil and roll them to make either round or oval shape (not very thin) bhaturas. 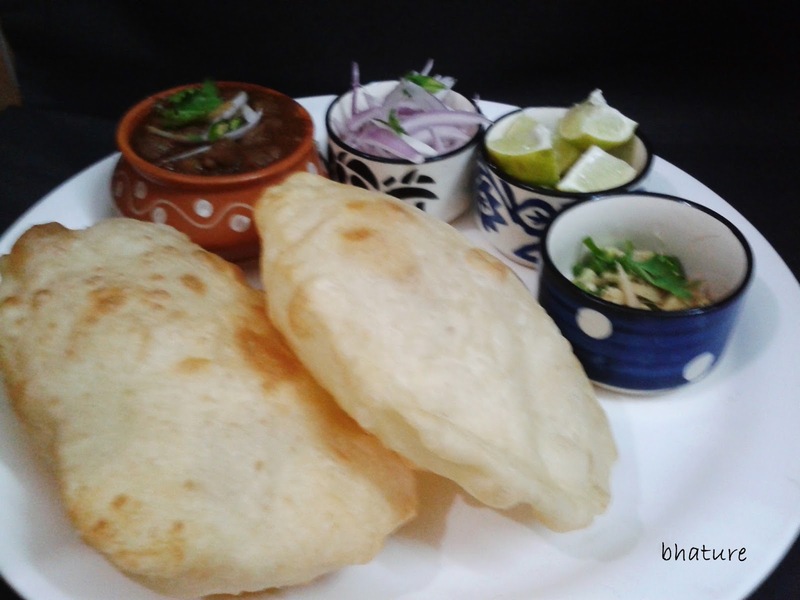 Heat oil in a kadai and deep fry the bhaturas on high flame till light brown on both the sides. Take oil in kadahi and add mustard seeds. When they start to splatter add peanuts,urad dal,chana dal,hing,curry leaves,ginger,green chilies and turmeric powder to it stiring continuosly. Now add the cooked rice and salt and mix well. Turn off the flame and add lemon juice and mix well. Wash and cut the karelas in round thin slices. Sprinkle 1/2 tsp salt on to the karelas and keep them on rest for 3-4 hours. Drain out the liquid and discard it . Wash the karelas once again. 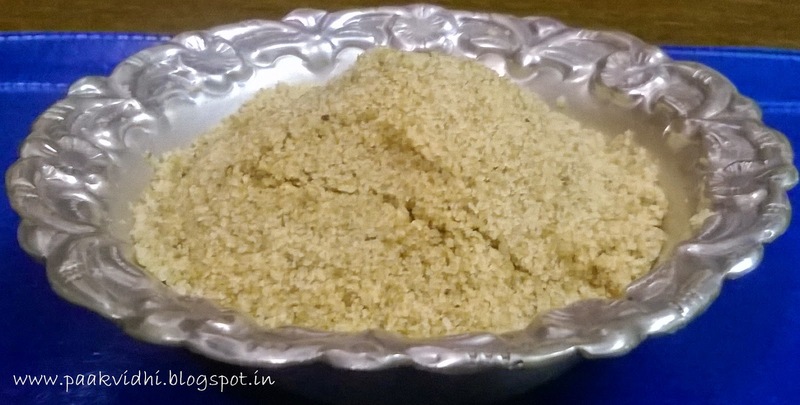 Take the oil in a pan and when it is hot add the cumin seeds and the asafoetida (hing) powder. Now add the sliced onions and stir them till pink in color. Add the washed karelas and the rest of the salt and put a lid on the pan and cook the karelas till they become tender stirring occasionally. Now add red chili powder,sabzi masala,amchoor powder,sounf powder,dhania powder and the sugar and cook without lid for another five minutes on low flame. Serve hot with chapati or parantha. 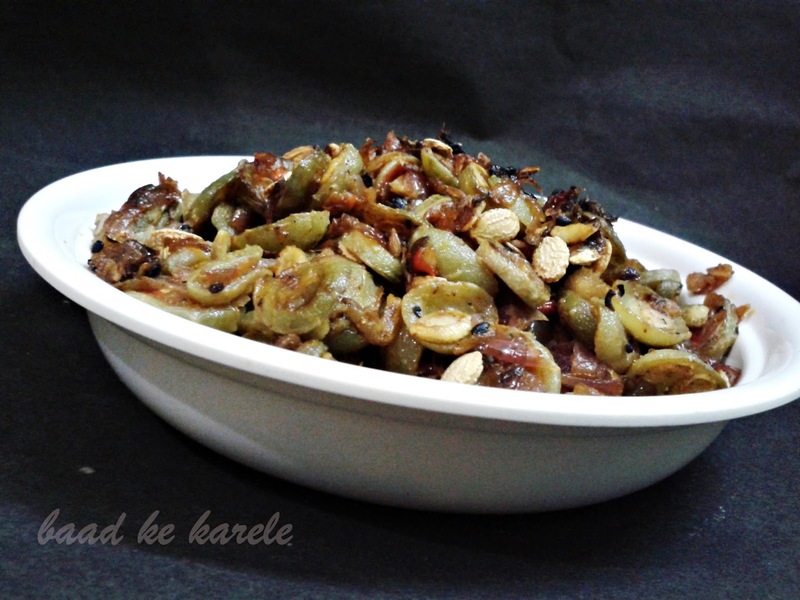 If baad ke karele are not available then it can be made with normal karela the process is same except you need to peel the karelas before sprinkling salt on them. Trim off the edges of each slice of bread. Mix rest of the ingredients in a bowl. Spread the mixture on one bread slice and put another slice on it. Repeat the process with rest of the slices. 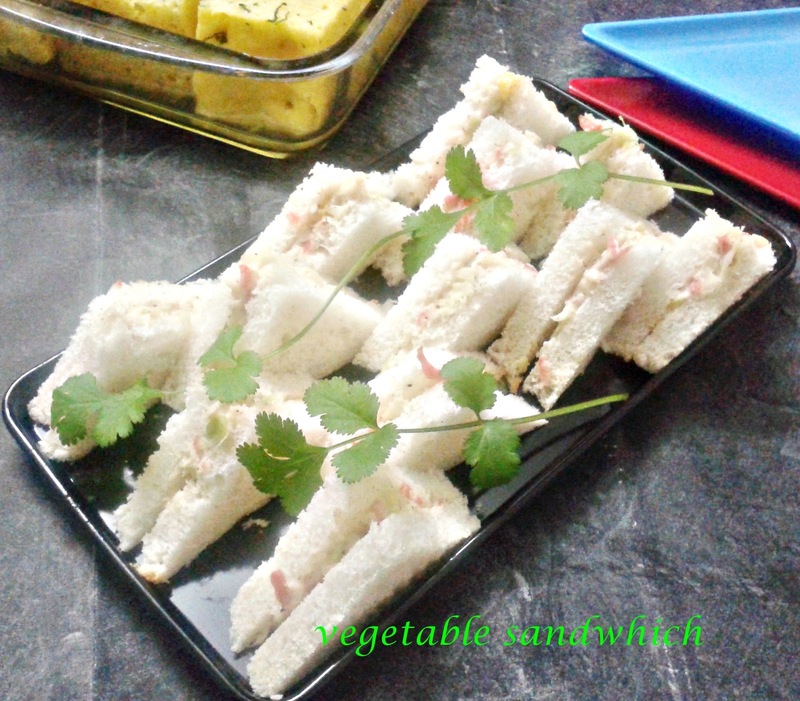 Cut these sandwiches in the desired shape. You can serve it like that only otherwise you can grill it in an OTG or a griller or patty maker or you can simply roast it on a tava. Serve it with ketchup or a dip of your choice. Heat 4 tbsp oil in a pan. Add onion,capsicum and cook till the onions turn pink in color. Add 4 tbsp maida and stir well for a minute. Add milk stirring continuously and cook till it becomes very thick. Add corn and green chilies and cook for a minute, then remove from fire. Add rest of the ingredients accept bread crumbs and maida mixed with water and mash well. Keep the mixture in fridge for some time and let it cool . Take small portions and give a desired shape with oiled hands. Dip the rolls in the maida and water batter and roll them in the bread crumbs and fry in hot oil till golden brown in color. 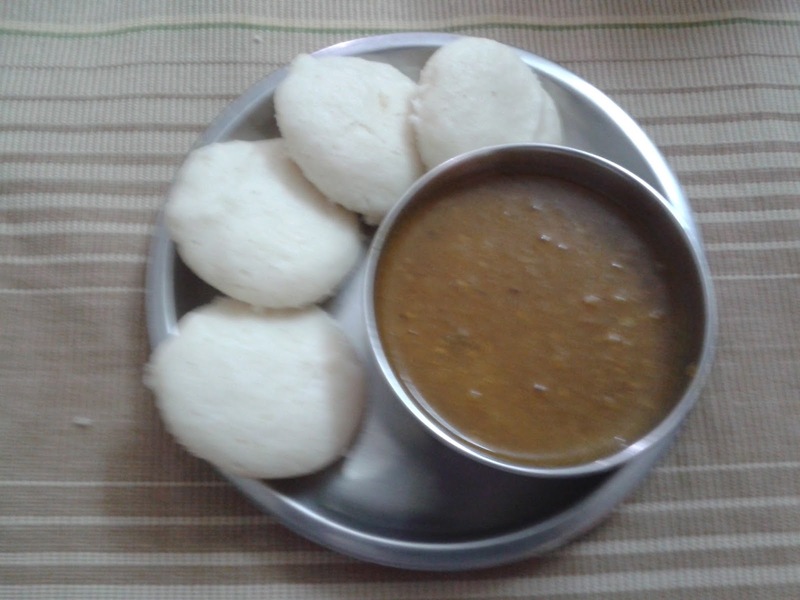 Serve hot with ketchup or dhania chutney. Soak the chick peas at least for four hours or overnight. Drain the water and mince them in a mixer. Serve it hot with mayonnaise(tahini paste) vegetable salad in a pita bread or you can enjoy it simply with ketchup or dhaniya chutney or humus . make small balls and roll out into very thin chapatis, edges may break but don't bother. otherwise you can bake them in a oven by spreading the tortillas out on a baking sheet in a single layer. Bake the tortillas for about 6 minutes, then use tongs to turn the side, and bake for another 6 to 9 minutes, until they are just beginning to color. Remove from the oven and let cool.the oven should be preheated at 350°F or 180°C. Add cumin seeds and cardamoms and fry till the oil becomes fragrant. Add the onion ginger and garlic paste and cook till it become brown. Add the tomato puree and saute for 2-3 minutes. Add the turmeric powder, red chili powder, kitchen king masala powder, coriander powder and mix well. Simmer and cook on low flame for 10-15 minutes till the gravy becomes thick. Add half the cream and salt. You can also add sugar or tomato sauce if you want a light sweet taste in the curry. Add the curry first in the serving plate or bowl and then place the koftas. 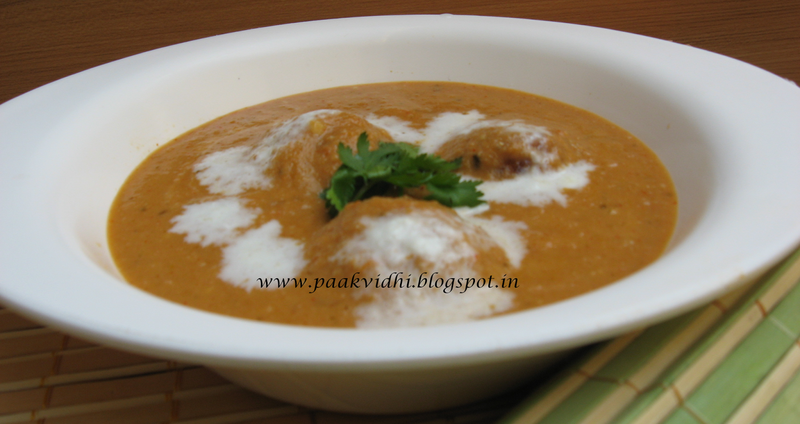 Serve malai kofta hot with rotis, naan, steamed basmati rice or jeera rice. Mix sugar in warm water. Add yeast. stir and let the mixture at rest at room temperature for 10-15 mins till it becomes frothy. In a bowl add one cup flour, salt, oil and the frothy yeast mixture. Stir and add another cup of flour . Add the last cup of flour and continue to stir. Knead the dough into a smooth, springy ball. Apply some olive oil all over the dough. Cover loosely with a damp cloth and keep in a large bowl at room temperature for 2 hours. The dough will double up. Make balls and roll the dough lightly to make a circular thick diskette of 10-12" diameter. When the onions are pink in color add tomatoes and cook till the tomatoes become soft. Add dried herbs ,salt ,sugar and black pepper powder and mix well. Bake the pizza in a preheated oven for 10-15 minutes at 200 degrees C or the cheese melts and become slightly brown in color. 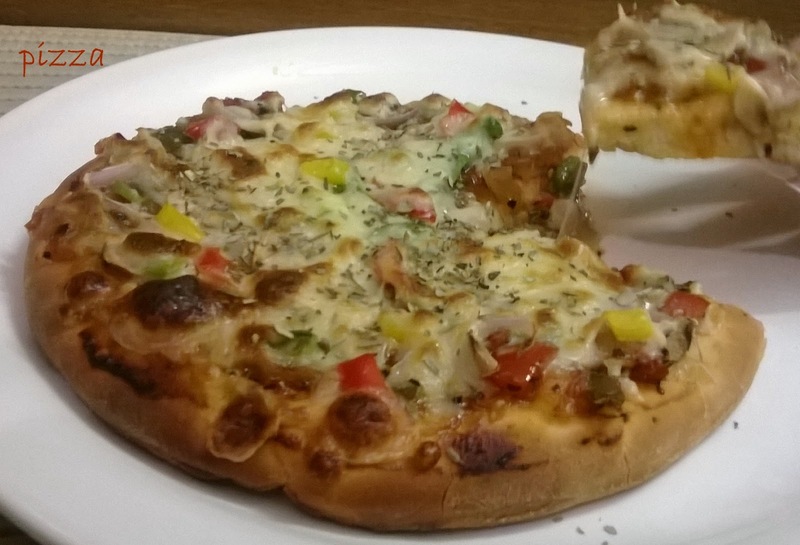 Slice the pizza in eight equal pieces and serve hot pizza with cold drink. You can use a ready made pizza base instead of making a pizza bread. you can use any other toppings as per taste like 8-9 pitted black olives, sliced or 4 baby corns slit into two pieces length wise or 1 tomato deseeded and diced. 1.Mix all the ingredients except water. while adding water the dough may become sticky still if it is sticky you can add wheat flour. 3.Keep the dough aside for 15-20 minutes covered with a kitchen towel. 4.Make medium sized balls from the dough. 5.Roll each ball thinly into flat discs of 6-7" in diameter. 6.Heat a frying pan or tava and place thepla on it. 7. Apply oil on both its sides, press gently with a ladle and cook until it turns brown from both the sides. 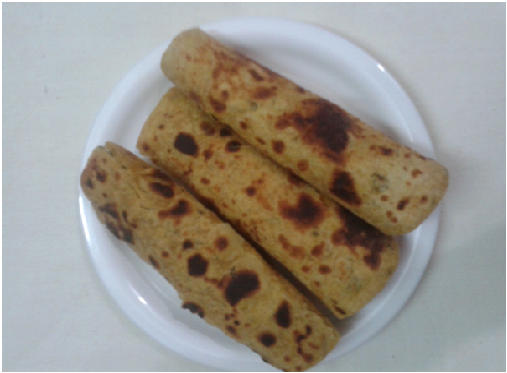 8.Once the thepla is cooked as well as browned, remove from the pan. 9.Make all the theplas this way. 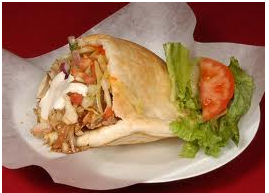 10.Stack them up and keep in a roti basket or in covered in a kitchen napkin. 11.Serve methi theplas with mango or lime pickles, or potato sabzi or you can just have them plain with tea. 1.If fresh methi is not available you can use dried methi (2 tbsp). 2.Instead of methi, finely chopped spinich or bathu leaves can be added as per taste. 1. 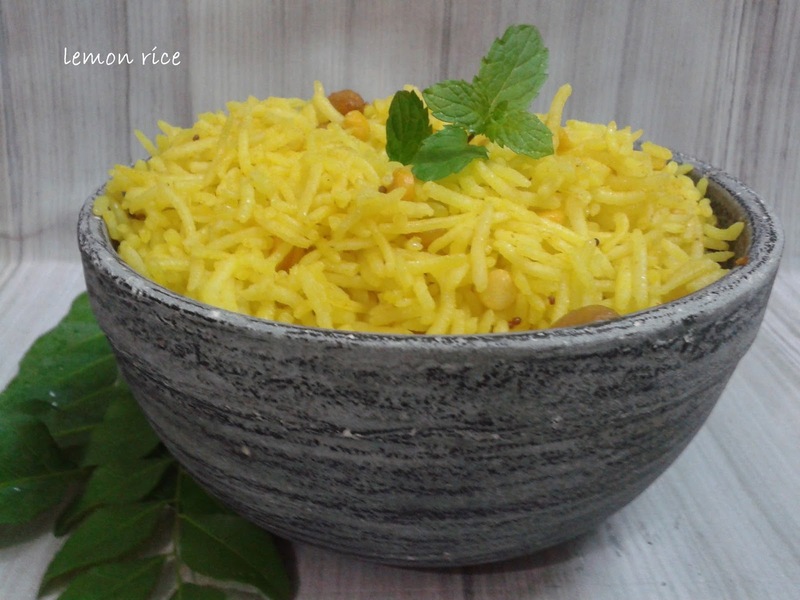 Wash and soak the rice and urad dal,fengurik seeds and chirwa in lukewarm water for 2 to 3 hours. 2.Drain,wash and grind to a smooth paste. 3.Cover and keep aside overnight to ferment. 4.Add baking powder,salt and oil. 5. 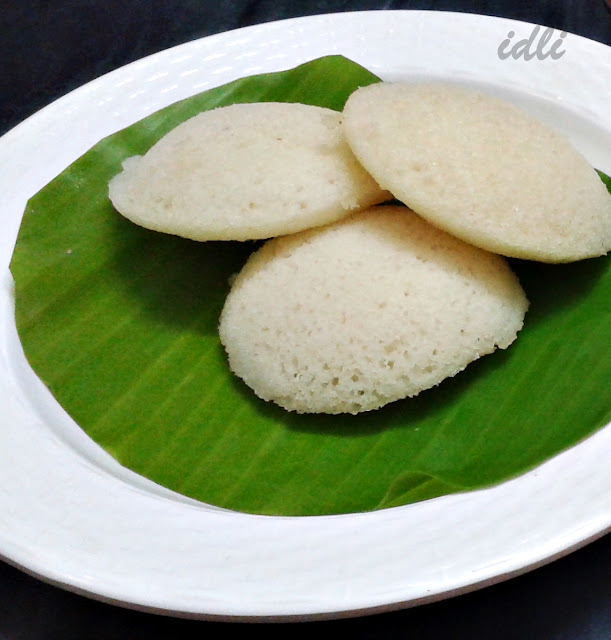 Grease the idli mold and pour the batter into it and steam for 15 minutes.Check it with a knife if done then unmold it and if not then cook for 5 more minutes.Do not over cook otherwise it will become dry. 6. Serve hot with sambher or chutney or both. 1.Mix atta,suji and ghee and make a stiff dough with warm water. 2.Make small flattened balls and deep fry in ghee on medium heat. 3.Remove when well browned. Break into pieces. Let it cool a little. Coarsely powder in a mixer. 4. Mix sugar,almonds and illaichi powder.